Hurricanes have caused a marked increase in damage and loss of human life over the last century, largely because coastal population and wealth have increased. The recent impacts of Hurricane Sandy, a minimal category 1 storm on the Saffir-Simpson scale (sustained winds of ~75 mph), in New York and New Jersey exemplify the vulnerability of developed coastlines to tropical cyclone strikes. 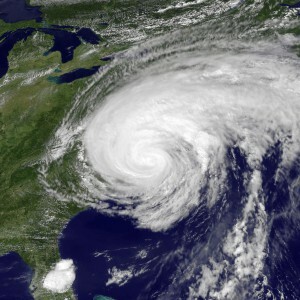 Damage estimates from Hurricane Sandy exceed 71 billion USD. New sedimentary proxy records indicate that historically unprecedented levels of intense hurricane activity impacted the eastern seaboard of the United States and northeastern Gulf Coast in the last two millennia. 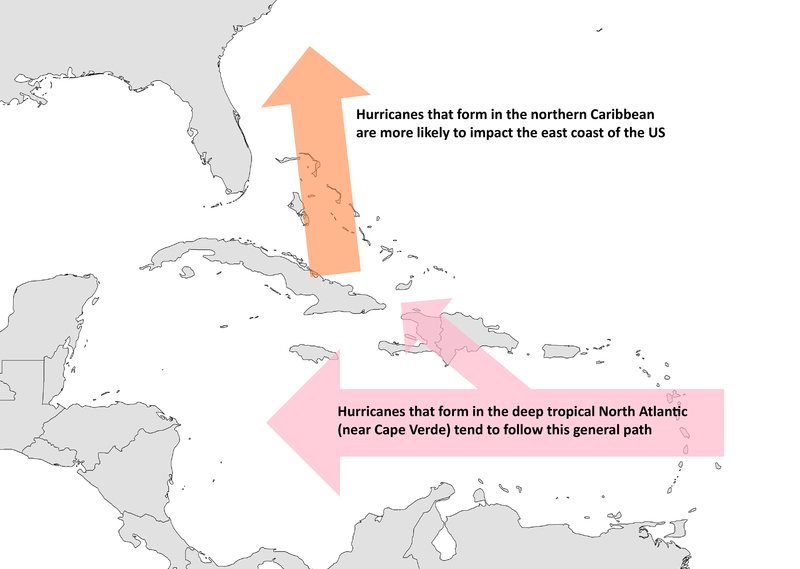 Given the recent increase in coastal populations and infrastructure, if similar levels of intense hurricane activity were to return, the results would be truly catastrophic. Determining the spatial and temporal pattern of this past hurricane activity and the climatic forcing mechanisms responsible for this unprecedented level of intense hurricane landfalls is critical to assess our future risk because these past hurricane patterns may be analogs for future climate scenarios. A new array of high-resolution sedimentary proxy records from deep coastal basins are transforming our ability to detect and analyze the underlying climatic forcing for tropical cyclone activity over the last several millennia. These deep coastal basins (coastal lagoons, ponds, and lakes separated from the ocean by a barrier) record overwash events, which can be used as a proxy for past intense storms. When a large storm (such as a tropical storm or hurricane) makes landfall, it can completely flood the barrier separating the ocean and the coastal basin, resulting in sheet overwash and sediment transport landward a kilometer or more. These overwash events are recorded in the sediment record as sand layers, which can be used to reconstruct information about the frequency and intensity of storm events. Recent research in the Coastal Research Lab has defined two active intervals in the North Atlantic hurricane record—historically-unprecedented intervals of event-bed deposition exist from 1420-1675 CE and from 150-1150 CE. 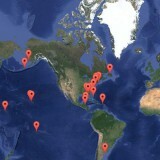 Similar records have been found along the east coast, ranging from local records in Massachusetts and Connecticut to correlative event beds in tropical blue holes in the Bahamas. 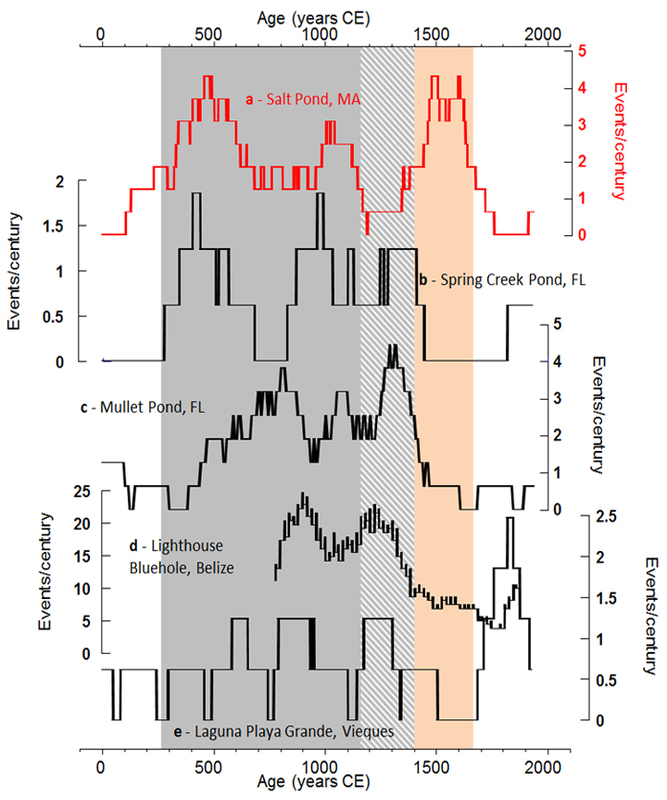 Interestingly, the more recent east-coast active interval occurred at a time of relative quiescence in the Gulf of Mexico and the Caribbean. This suggests a mechanism exists to restrict storms to the east coast during the more recent active interval. The earlier east-coast active interval was in phase with an active interval in the Gulf of Mexico and Caribbean from 150-1150 CE, but the reconstructions from the Caribbean and GoM all remain active until about 1400 CE, while the east coast is quiescent between 1150 and 1400 CE. This suggests that either storms failed to track up the east coast and/or conditions were not favorable for intense hurricanes to maintain their strength off the east coast at this time. Current research is focusing on constraining changes in the genesis location of storms that ultimately make landfall in on the east coast, as well as constraining the intensity of major storms in the record. Coherent patterns have begun to emerge from these western North Atlantic paleo-hurricane reconstructions that are changing the way the way the scientific community needs to think about climate-hurricane interactions. 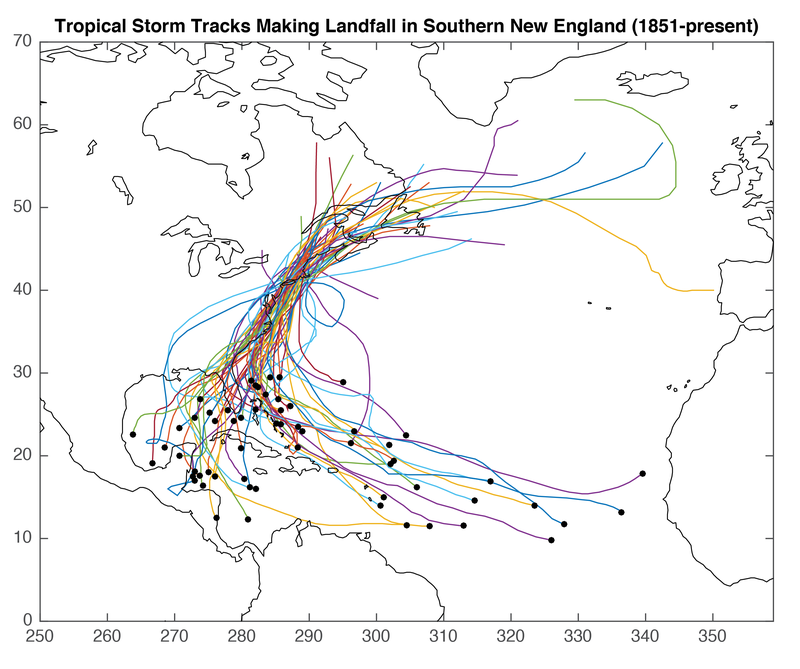 These reconstructions clearly demonstrate that the preindustrial climate system was at times able to produce historically unprecedented levels of intense hurricane activity along the eastern seaboard of the U.S. where more than a hundred million people now live. These new archives of hurricane landfalls indicate that the Gulf of Mexico and East Coast are sometimes in phase, but sometimes they are not. 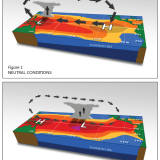 In order to diagnose the climatic forcing responsible for these dramatic changes in hurricane activity it is essential to determine if they result from changes in regional or local conditions or whether they reflect changes in basin-wide activity.